An intelligent, efficient way that drives costs down and satisfaction up. Let Genesys help you meet these criteria and guide you to designing, developing and delivering a best-in-class IVR Platform that ensures a Great Customer Experience. Improve your game and score more wins across the business, with your customers. 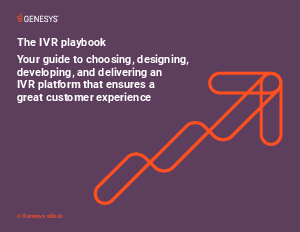 Achieve your IVR goals by downloading our IVR Playbook here.